By Sylviane Diouf, Chronicle Books. Ages 4-8. 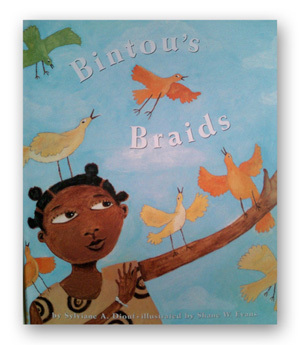 This is a beautifully written and illustrated book about Bintou, a young girl in a West African village who wants, more than anything, to be an adult and have the braids that represent this. She ultimately proves her maturity and her village celebrates her in this universal coming-of-age tale. Evans’s experience in Burkina Faso directly impacted the visuals in this book. Inspired by the places and artists that he encountered in his travels, he drew on their energy to produce this lovely, stylized piece of work.